This past week, Elise Bauer, who publishes Simply Recipes, a wonderful food blog full of her family's quick and simple whole food recipes, posted a recipe for Beet Hummus. I immediately decided to try it with a couple of roasted beets I had sitting in the fridge, only I failed to notice that the recipe did not call for chickpeas. Elise uses the roasted beets as a replacement for the chickpeas in her recipe, and I ended up adding the beets in addition to the chickpeas. 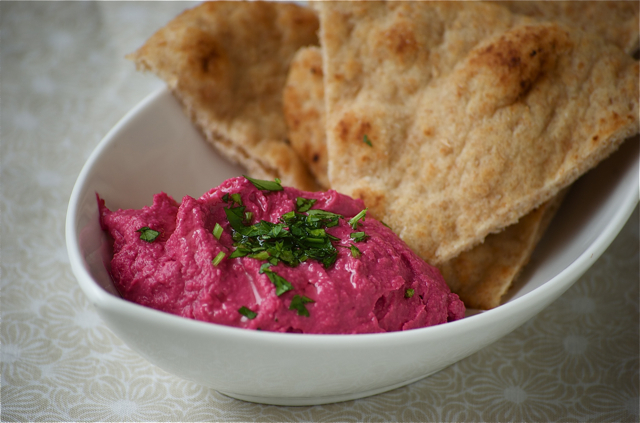 The result was a beautiful fuchsia-colored and delicately sweet hummus that is perhaps a lot more filling than Elise's original recipe, but with a milder roasted beets flavor. I share it with you, so that you may try both recipes or take your pick between the two. I will definitely give the original version a try in the future.